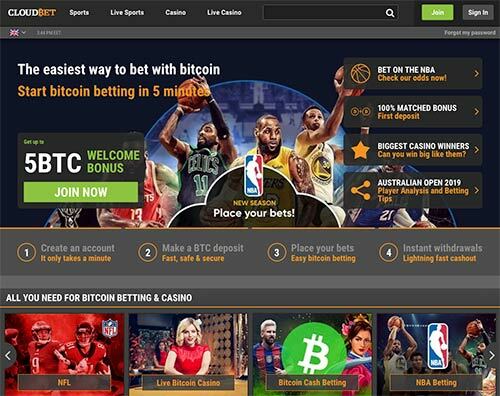 Micro-betting at CloudBet: Minimum bets lowered to 10 Satoshi! If you are looking for low stakes Bitcoin betting, look no further. Cloudbet has lowered minimum bets to an only 10 Satoshi. That is about 0.0003 EUR or 0.0004 USD. This is Cloudbet and the modest but functional lobby. Starting from March 6, 2019, with only 10 Satoshi, you can place a bet on Cloudbet. That doesn’t sound like much, but with the right odds – say, 100 to 1 or more – such small value can potentially turn your proceeds into a considerable sum. Perhaps you would like to just test the waters and your analytical skills before you want to take bigger risks in betting. You can take smaller risks and sleep your nights well even if you missed all bets. Maybe there is some leftover BTC in your account that you want to spend. Or perhaps you only want to get as many betting thrills as you can. With micro-betting you can place a lot of crazy bets with huge odds, and not worry too much if you don’t catch the bets. Well, for your typical 1 – 3 € coffee you can place up to a whooping 3 000 – 9 000 bets – that’s how many minimum bets you can get. Here is one example about recent big win at Cloudbet. And to be honest, this bet wasn’t micro-betting but you can choose the bet level that is suitable for you. In 2017, when a lucky basketball fan placed a 0.005 BTC at 2387.4 odds. 0.005 BTC is now about 20 USD or 17 EUR. This daring decision ended up becoming a major win, netting the player nearly 12 BTC winnings. That is over 40 000 € – not bad! If you want to try micro-betting at Cloudbet, you can check my review of the site or go directly to Cloudbet!